20-year limited warranty available upon written request except for Crimson Red (10-year). For warranty information outside of the continental United states, please inquire. * Silicon White is a non-siliconized polyester. Trim available in all colors. All products available in smooth finish. Consult factory for embossed finish pricing and availability. Heavier gauges, narrower widths, striations and embossing minimize oil canning. A 20-year limited finish warranty available for all colors upon request. Outside the continental United States, please inquire. All colors approximate actual finish colors as accurately as possible. Actual color may vary slightly. 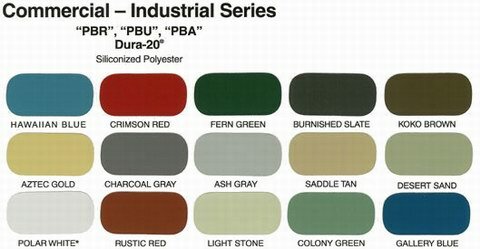 Final color selection should be made from actual color chips.